Rovinj is Istria’s showpiece, its answer to Dalmatia’s Dubrovnik, with far fewer crowds and a more realistic view of itself. It maintains a meticulously cared-for old quarter and extensive tourist amenities without feeling fake or overdone. The natural setting is stunning: a harbour nicknamed ‘the cradle of the sea’ by ancient mariners because the archipelago of islands, stretching from here to Vrsar, ensured calm, untroubled waters. The man-made structures in the Old Town are also attractive: tightly clustered houses, painted in cheery Venetian reds and Habsburg pastels, connected by cobbled streets barely wider than a footpath. 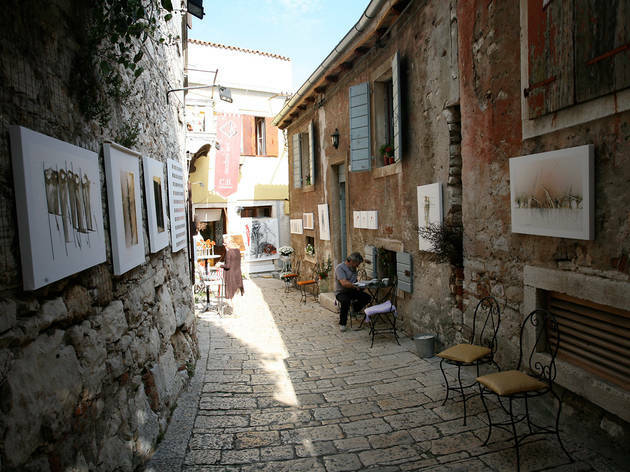 Rovinj is Istria at its most chic, a scenic resort of quality restaurants and cocktail bars, galleries and boutiques. Stone houses and cobbled streets lend an authentic air – this is also the most gay-friendly of Croatia’s coastal destinations. 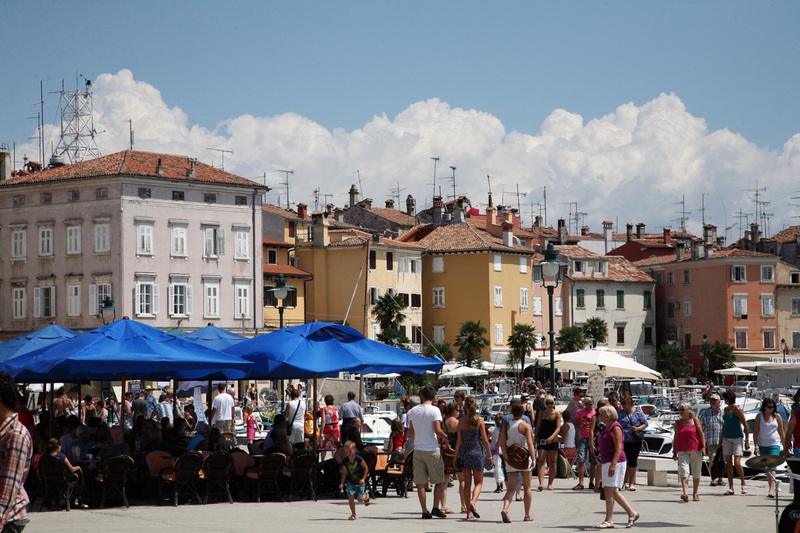 RECOMMENDED: more great things to do in Rovinj. 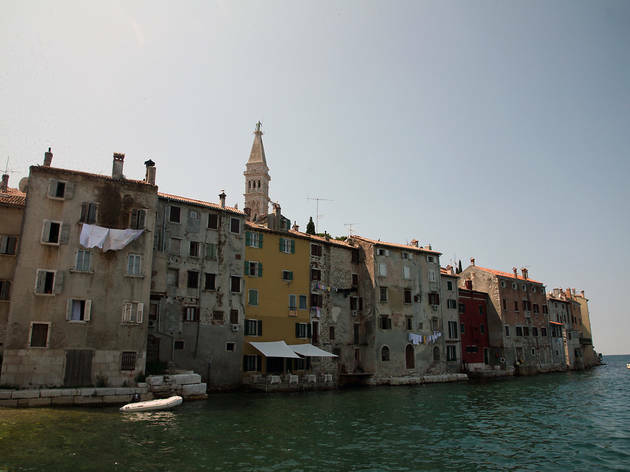 Rovinj‘s meticulously cared-for old quarter and stunning natural setting, combined with shaded, rocky beaches, have been bringing in groups of tourists since 1845, when a steamship line from Trieste stopped here. And yet tourism has not overwhelmed Rovinj or closed the local fishing trade, which still brings fresh catches to its excellent restaurants. Traditions are celebrated – hence the recently opened multi-media museum dedicated to the local batana fishing boat, Batana House. 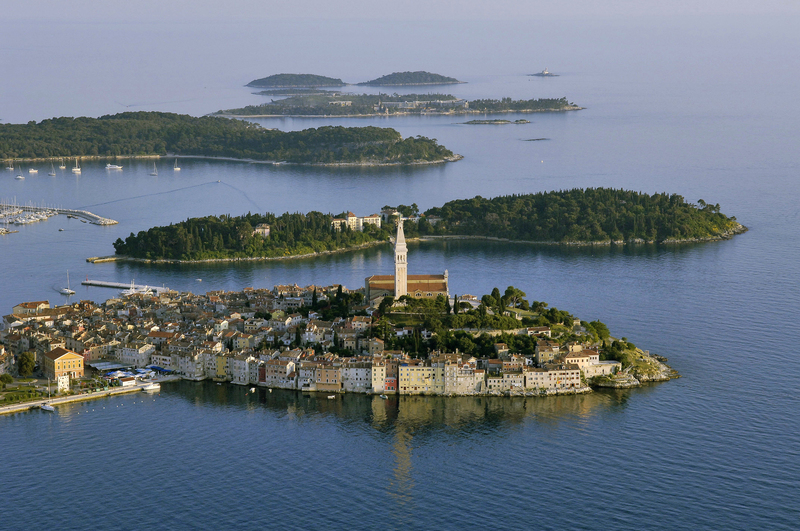 Rather than overdevelop, Rovinj has sought to retain its old charm – a charm for which tourists pay a premium. 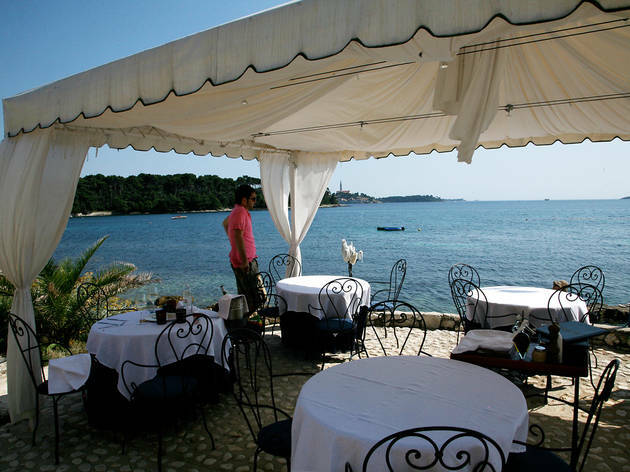 This is one of Croatia’s nicer, and pricier, resort towns. Before World War II, this was an Italian resort, and the large Italian community, which includes many restaurateurs, encourage an emphasis on fine dining and good living. 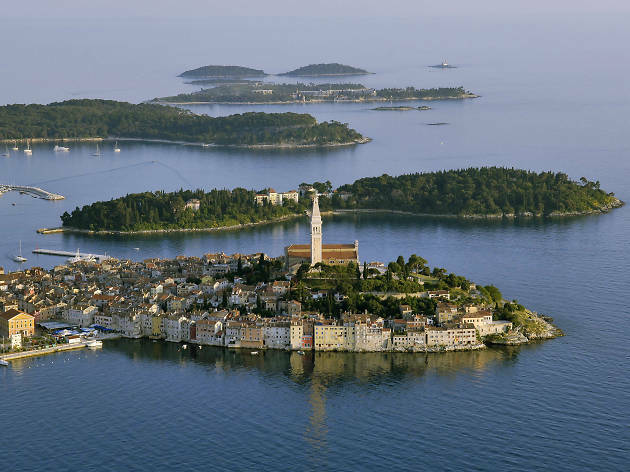 Rovinj has been settled since at least the seventh century, when it was an island centred around a low, cone-shaped hill sticking out of the sea. The populace overflowed to the mainland, and the construction of a causeway in 1763 turned the island into a peninsula. The hill still defines the shape of the mostly car-free Old Town, and an easy stroll up the spiralling road to the top affords views of surreal beauty. 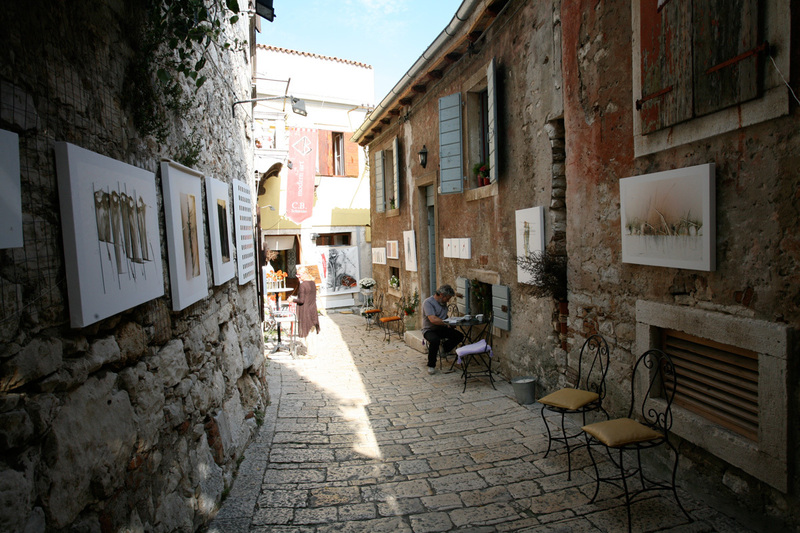 Rovinj specialises in galleries and arty knick-knacks. Palatial Atelier Devescovi is where artist Dean Devescovi sells paintings with jazzy influences. Atelier Sottomuro is a super little gallery where UK-raised Jan Ejsymontt purveys her acrylic paintings and jewellery. Atelijer Galerija Brek is great for off-beat accessories. For fashion, Rovinj-born Mauro Massarotto’s Sheriff & Cherry is by far the funkiest in Istria. The Startas range of sneakers designed by Massarotto himself for the Borovo shoe company, plus sunglasses, dresses, T-shirts, bags and brooches designed by leading Croatian talents, are all available through the website – unfortunately Mauro no longer has an outlet in town. 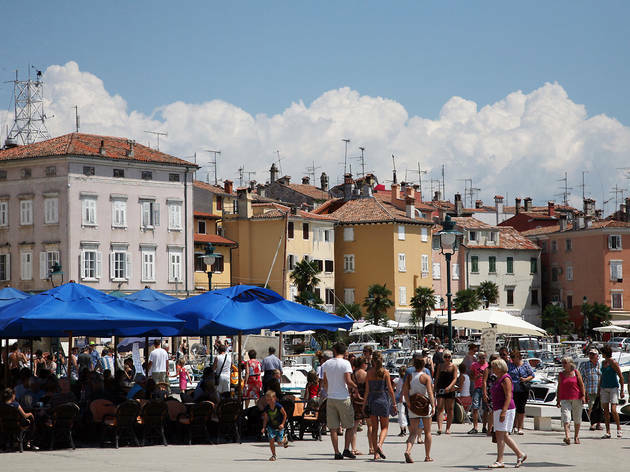 For food, Rovinj market on Trg Valdibora is open from 7am daily. 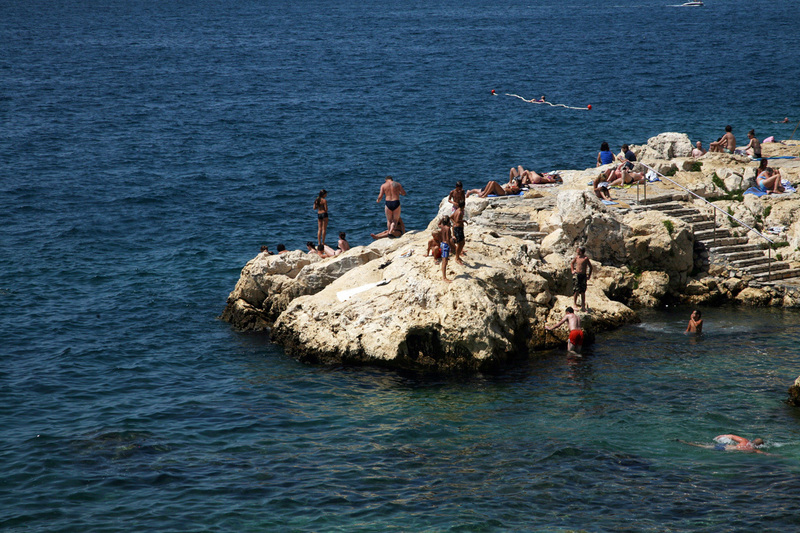 Popular with locals is the small swimming area consisting of rocks and concreted platforms on the south side of the Old Town’s peninsula. For the pine-forested beaches at the edge of town, you’ll need sandals to wade on the jagged shore, but the lack of sand means the sea is incredibly clear, great for snorkelling or diving. The walk along the water is a little more than a kilometre from town: head past the Hotel Park, to the area of Monte Mulini and the succession of pebbly coves that forms the south side of Lone Bay. 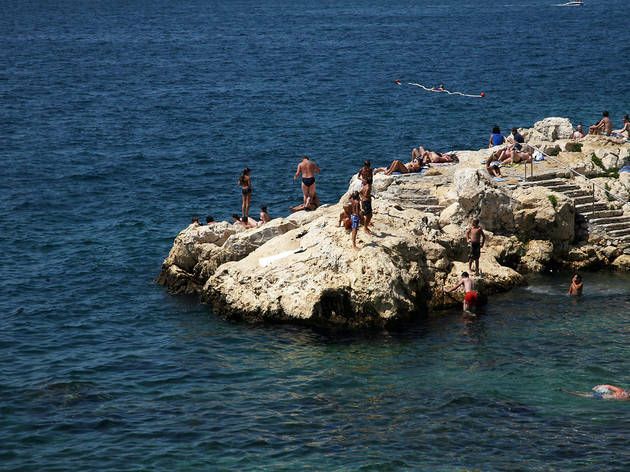 The bay culminates in the wooded peninsula of Zlatni Rt (Golden Cape), beyond which lie quiet stretches of shore where you can find your own private boulder to sun on. About 3km south of town are two nudist beaches, Polari Bay and the adjacent Cape Eve. The 13 small islands here have thick forests surrounded by rocky beach. The most popular excursions are to nearby Sv Katarina Island and dazzling Crveni (‘Red’) Island (consisting of two islands, Sveti Andrija and Maškin, joined by a causeway), both a short hop by regular taxi boat over from the main harbour. Local travel agencies offer trips to the Limski kanal, a pectacular fjord of green waters. 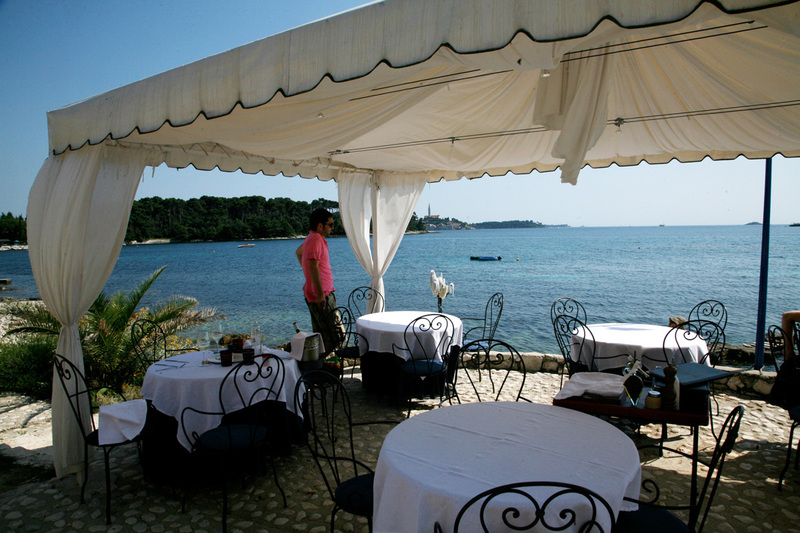 As well as being extraordinarily picturesque, Rovinj has long excelled when it comes to fish restaurants. You’ll find the pricier ones on the harbourfront offer waveside seats, but if the food on the plate takes priority over a sea view, there are plenty of classy maritime and Italian options in the narrow streets of the Old Town. Popular Blu adds a contemporary touch, in a stellar setting. 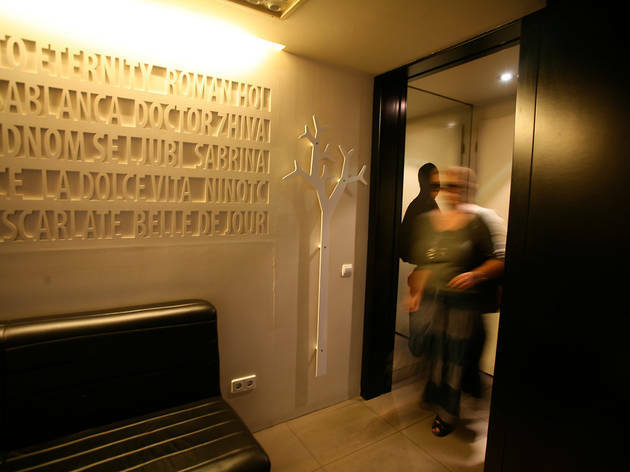 The Wine Vault restaurant at the Hotel Monte Mulini and the L Restaurant at the next-door Hotel Lone are among Istria’s best options for modern Adriatic cuisine, and Male Madlene is an interesting option for bite-size haute-cuisine. 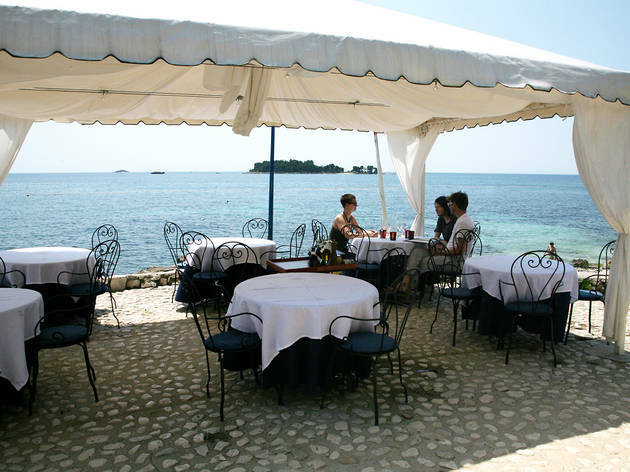 The cafés at the north-west end of Rovinj harbour, such as the cocktail bar Valentino, is great for sundowners. After dark, the best bar crawl is in the tiny streets at the bend of Obala Alda Rismondo and in Joakima Rakovca, a little street near the harbour. Starter, swim, main, swim, dessert, swim. 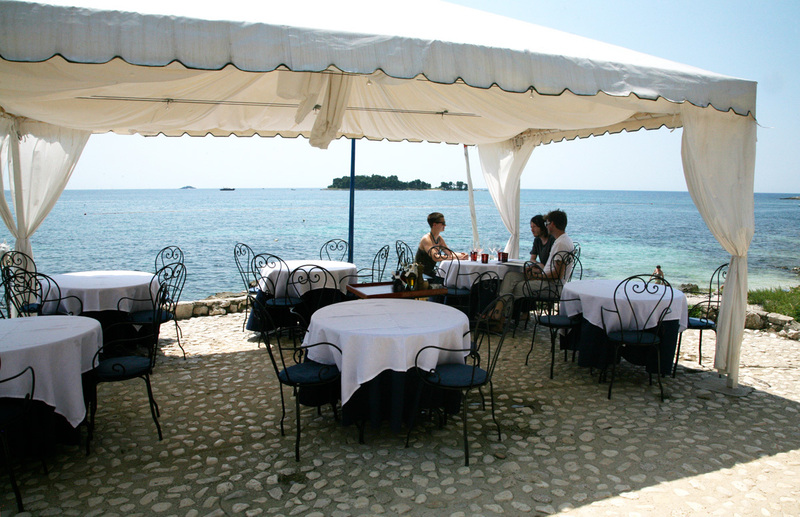 Yes, the waterside Blu restaurant has a great location, best enjoyed over a leisurely lunch. 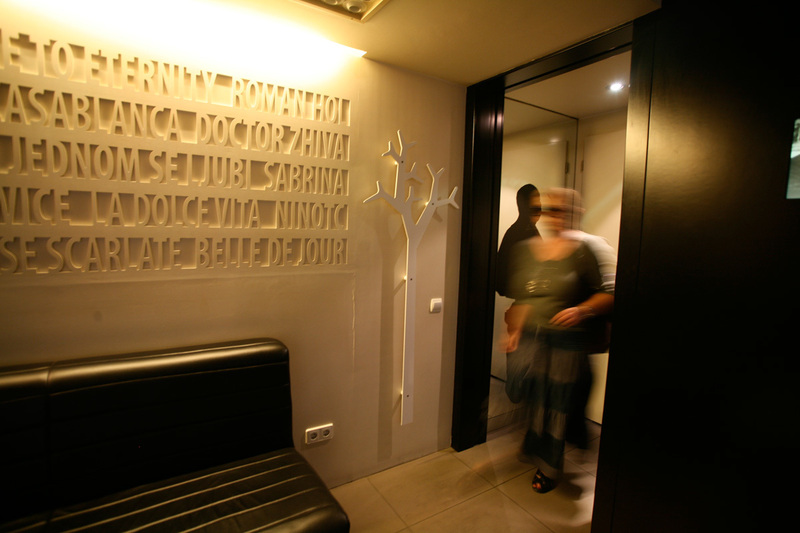 Relax among locals, tourists in the know and day-trippers from Zagreb. Peruse the menu over a glass of Malvazija and home-made thin pizza-style bread with rosemary, sea salt and award-winning olive oil produced nearby. Food is sensibly fish- and seafood-based and ranges from Novigrad oysters in tempura or scampi and black truffle risotto, to gilthead bream baked in a crust of salt. Simple roast fish with potatoes is also available, the ideal dish to be shared among a table of four. The dark-chocolate soufflé is scrumptuous. 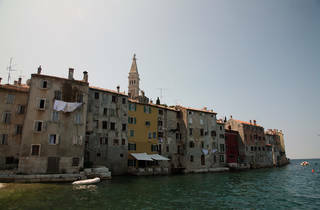 Prices are less than you’d imagine considering the quality and view across the sea to Rovinj’s Old Town. Inside, evening dining is a little more formal, around set an old Roman garden. A fashionable terrace adds a touch of class to this busy corner of the harbour and draws a sizeable, mixed crowd. The spacious, dramatic black-and-white interior is dedicated to great films, with stills from old classics and a life-sized Alfred Hitchcock doing his cameo in the bathroom mirror. Behind the long bar is an oversized clock and, most often, a smiling face serving drinks. Music, ranging from pop to electronic to hip hop, generally has a fast beat. A fun spot.